Allow us to preface this article with this statement: All bits are coercive. Any bit can be used severely by a dominating rider. But if we remember that the aids, including the hands and bit, are to encourage the horse to find a place to be comfortable, then it will help us to remember to release the pressure when the horse obliges. As we remind the students at our clinics, "Remember: Horses are people, too!" We have a lot of bits we use regularly. And we have a bushel basket full of bits we no longer use at all. But we do have some favorites that seem to get used a lot, and seem to work on a lot of different horses. If we could only own a few bits, these are the ones we would want to own, and we feel we could ride any horse with a bit from this selection. We do not sell bits, but we will list our favorites here and tell you a little about them. We start all our colts in a snaffle, but we continue to train with snaffles throughout their performance careers. 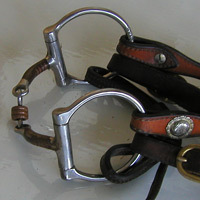 Snaffles offer a direct connection between the rider's hands and the horse's mouth. You can't beat a snaffle for teaching a horse to flex. 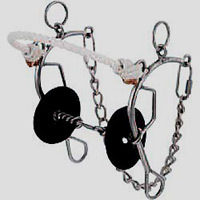 For more information on snaffles, you might want to reference our article on Snaffle Bits. Below are a couple of our favorites. The style known as a Don Dodge is a modified D-ring. You can see from the photo that the hinge will lie along the horse's cheek, and therefore will profide a solid feel to the horse, avoiding the possibility of being pulled through the mouth, which can happen with a ring snaffle. The closed hinge also completely eliminates the possibility of pinching. This bit is a Jeremiah Watt hand made bit, and features two characteristics we especially like to see on all our snaffles: a sweet iron mouth with a copper inlay. The style known as a Western D-ring. Compared to an English D-ring, it is not as broad at the hinge. As with the bit above, the hinge will lie along the horse's cheek, and therefore will profide a solid feel to the horse, avoiding the possibility of being pulled through the mouth. The closed hinge also completely eliminates the possibility of pinching. This bit pictured here is a Myler, and features a sweet iron mouth with a copper inlay. Horses seem to like this bit - the three piece mouth eliminates pressure on the roof of the mouth, and the small copper roller moves if the horse is inclined to play with it. Note the characteristic bend in the mouthpiece that you will find on all Myler bits, designed to work from a different place on the bars of the mouth. All Myler bits have a high quality finish to them. This is a bit for riders who have some feel in their hands. It has received criticism in recent years, and is regarded as severe by some celebrity horsemen. If you do not have soft hands, if you do not know when to release rein pressure, then please avoid this bit. But if you have ridden horses in snaffles, if you have started colts and made them light to handle, then you might want to consider this bit. It cannot be called a curb bit because it does not have shanks and a curb, but it is really not a true snaffle either, since it does work on the chin. The mouthpiece is oval-shaped, and lies very comfortably on the bars of the horse's mouth. 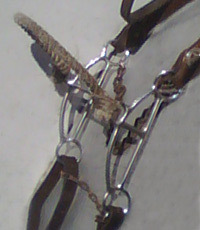 Unlike an ordinary snaffle, the mouthpiece hinges in the center only one way, closing downward, with the smooth spoons contacting the horse under the jaw, encouraging the horse to give to the bit and flex at the poll. The spoons are slotted for a tether strap. We find our horses seem to like the oval shape of the mouthpiece, and if a horse starts getting strong and rooting on a regular snaffle, then this bit encourages it to back off. 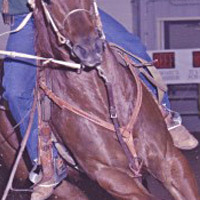 The action of this bit is such that when rein pressure is applied, the horse is most comfortable carrying it's face vertically. We don't ride with it all the time, and we don't use it on all our horses, but it works so well for its intended purpose that we would hate to give it up. Our horses do not complain about this bit - they are comfortable with it. Gag bits are great for speed events because they naturally tend to absorb some of the shock generated by rough hands. 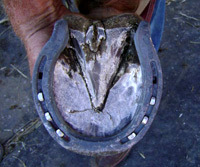 A gag bit is a bit with a mouthpiece that slides on the shanks of the bit and rises up in the horse's mouth when the reins are applied. They can provide a lot of control, but they also provide some warning to the horse before everything comes tight. 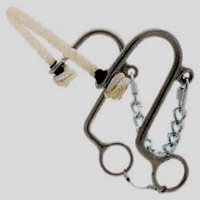 Gag bits should be adjusted at the headstall so that the mouthpiece is at the bottom end of the gag travel and the mouthpiece just touches the corner of the mouth - it doesn't cause wrinkles, and it doesn't dangle below the corner. The curb needs to be loose enough to allow the gag to work. If it is too tight, the mouthpiece can't slide. If it is too loose, the mouthpiece will slide all the way before the curb takes effect. You want to adjust the curb so that when the horse really needs to be handled strongly, the shanks are just slightly past 90 degrees - the angle of greatest leverage. This is a combination bit. It looks like a lot of bit, but really it is not. It has a three-piece dog bone snaffle type mouth with rope nose. The shanks are not long, and the curved structure seems to help collect and raise a horse up at the withers. We use this bit for competition for both barrels and poles. It seems to provide a solid, in-control feel. 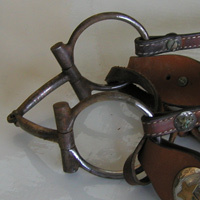 Note that the headstall rings are hinged, and this prevents a horse from being poked in the cheek when the rein is applied. Most horses seem happy with the dog bone mouth. Reinsman makes a copy of the Million Dollar Bit, but we like the Josey version better, and it is less expensive. The rope nose on the Josey bit is tied to the cheeks and remains in place, where the Reinsman nose has a hinged attachment and has a tendency to sag. Pictured here are two models of this bit, which are close to identical. They are medium shank three piece twisted wire with a dog bone. The one on the left is an Ed Wright bit, and the one on the right is a Sherry Cervi model. Take your pick. Horses seem to like this bit and don't complain when the rider picks up the reins. 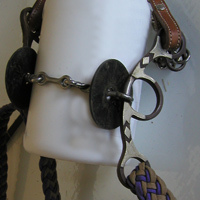 It is especially well suited for use with a German Rein, because the drawing portion can be run through the gag loop (See our article below for more information on rigging the German Rein). We also use hackamores for speed events, but we're very particular about which ones we will use. You need to be careful with hackamores. 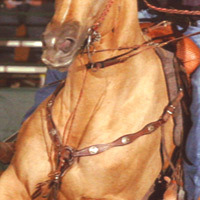 Many are built in such a way that the upper headstall ring will poke into a horse's cheek when a rein is tightened. Another caution about hackamores - they will make a horse stiff if you ride with nothing else. We ride a LOT in snaffles, and the flexion and suppleness developed there can be readily transfered to a hackamore with just a little patience. This hackamore is one we often use to introduce our colts to the curb after their initial snaffle training. It does not have a lot of whoa, but we like the way it fits on a horse. The broad sweeping curve at the headstall applies a real even pressure when a rein is lifted - no poking the horse in the cheek as with so many hackamores. We take it easy and give them a chance to get used to the new feel, but in just a ride or two, the colts are responding with bend and flex as if they were wearing a snaffle. We have used this bit in pole bending competition on our futurity horses. This hackamore is no longer in production, but it works so well that we hunted up a second one. It has more whoa than the Little "S" above, and horses seem to like it. It must be the dimensions that make this one special. There are hackamores that look similar, but they just don't seem to work as well. You won't find these in your local tack shop, but if you see one of these among a friend's tack, offer to buy it. You won't regret it. 'Tie down' is a really bad name for this piece of equipment. It shouldn't tie anything down, and if it does, it is abusive. Instead, think of it as a 'head flip limiter'. Not all horses need a tie down, and we prefer to run without one. But a tie down can help with control of a strong horse, and it can be insurance that can save a run if your horse is inclined to toss its head at just the wrong time. Normal adjustment would be a length that would allow the tie down to be pushed to the horse's throat when he is standing at ease. Adjust it tighter for more control, realizing that a tighter tie down might possibly take some of the run away from the horse. We like the tie down to run all the way from the noseband to the cinch. All our breastcollars have a dee attched about 6" below the "Y". We use a 3" leather loop on that dee, a hobble of sorts, and run the tiedown through that so the horse can't get a leg over it and trip. We don't like tiedowns run behind the breastcollar because it softens the effect - it feels springy or mushy. In this photo, you can get a pretty good look at the way we set up the tiedown. This noseband has a plastic coated cable nose, but we like nosebands made of lariat rope as well. The plain flat leather style will not deter a horse from pushing against it. Those are fine for roping, but we don't like them for speed events. You can see the leather loop on a dee about 6" below the "Y". The breastcollar should be positioned above the shoulders so that it does not interfere with the horse's reach when running. A hobble strap run from ring to ring over the withers often helps keep it up and in place. 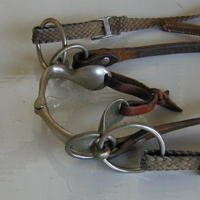 A German rein (or German martingale) is a great alternative to a tie down for horses that could use some head setting or nose control because unlike a tie down, a properly adjusted German rein only takes effect if the horse takes its head out of position and resists the regular rein. It shouldn't pull the head down, and if it does, it is abusive. Here is a photo of a bit with a mild gag, rigged with a German rein. 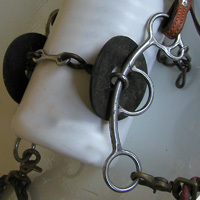 Note that the German rein is run through the gag loops at the mouthpiece, not through the rein rings. If you would like to know how to make an effective yet inexpensive German rein, we have supplied the details here >>. I call them "sticks", rather than whips, because of the way I intend for them to be used. The most valuable feature of these sticks over others is the large cap, which makes them nearly impossible to drop. I remove the popper from the end, as it serves no useful purpose for me since I have no intention of using them as whips. You can hold a pair along with the reins, one in each hand, with a wide rein position, and apply a tap behind the leg following a leg cue. Much more effective than spurs for introducing a horse to lateral work. I purchased mine from Horse Tack Co.. I use the 39 inch length for our quarter horses. The finger whip hangs on the back of your middle finger, hands stay free for the reins - quick action, always available, and you will never drop it! 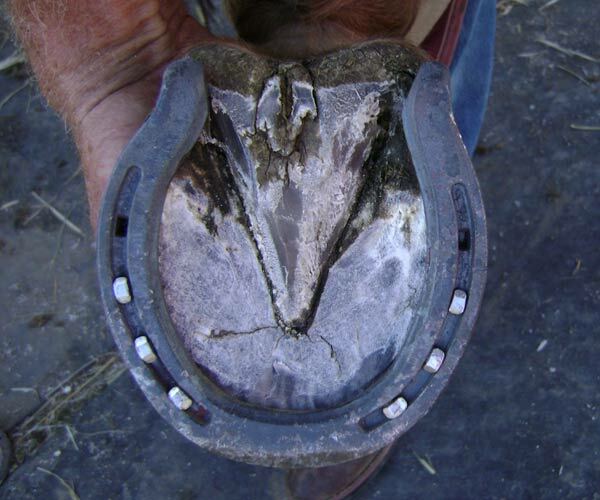 People at the clinics often ask how my horses are shod. The answer is: St.Croix lite rims in front, and St.Croix lite plains behind. The hinds are turned back at the heel about 1/2 inch, straight back under the bulbs of the heels, so as to increase the length of the base of support, and the toe is beveled to approximate the bevel of a natural rim shoe. I will shoe them all like this unless a horse has a problem slipping behind. I feel it is good to allow a little give and slip behind, as it is easier on their hocks. In the very rare case of a horse slipping, I will use lite rims behind as well as in front. All photographs and text on this site copyright Sunrise West Quarter Horses, LLC, all rights reserved. Comments about the site structure should be directed to webmaster (at) sunrisewest (dot) com.